All of our 41,000+ of our Keeley 4 Knob Compressors have been hand built in the USA. It’s been at home on stages, the studio, churches, as well as bars and bedrooms! The Keeley Compressor was given the Editor’s Pick Award from Guitar Player’s Magazine and recently awarded Reader’s Choice for Stomp Box. 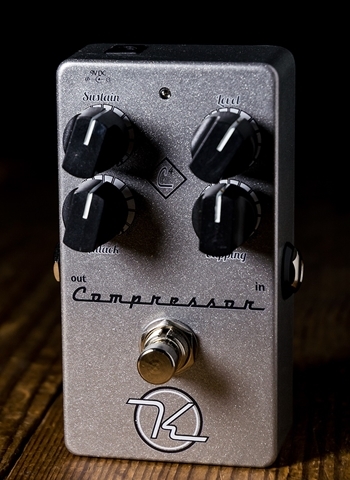 Keeley's most popular pedal, the Keeley compressor has become an industry standard for stomp box compression. The sound will inspire, and your music will flow freely-just plug the compressor pedal in and let your head, heart, and fingers fly. The sound quality of the Keeley compressor is rarely heard in the stompbox arena and is only seen in very expensive rackmount or tube equipment. It is a true audiophile and studio-grade compressor, with exotic rackmount-quality in a stomp box. The Keeley compressor pedal ships with the 9V DC jack at the top end of the guitar pedal and use the same type of power supply used by nearly all guitar effect manufacturers. The compressor pedal has an Internal Attack control, designed for bass players with high-output active pickups or active pedal boards with buffers. The Keeley compressor pedal also has an Input Sensitivity Control, meaning you can use this in your studio to run keyboards, drum machines, drum mics, even master recordings and other line-level uses. You'll raise your signal to a new level of sonic awesomeness. True bypass means that when the effect is off your guitar tone will not be affected at all. The true bypass circuit makes sure you have absolutely no tone loss or signal reduction through the compressor pedal in the off/bypass mode. This switch makes sure you have absolutely no tone loss or signal reduction through the Keeley 4-knob compressor even in the off mode. Other compressors use a cheap switch and design that runs down your signal even when off or if the battery goes weak. The 9 O'clock position should be barely noticeable. It will just take out really loud sudden peaks, this is great for protecting your speakers and the like. The 12 O'clock position provides the right presence for using the Keeley compressor pedal continuously while performing. The 3 O'clock position is great for solos. It really adds some cool effects to your playing dynamics. Only when really cranked do you get the pluck sound of your pick emphasized. The Keeley compressor effect has nothing but tone-tested components and has true bypass switching. Effect switching incorporates a triple pole-double throw switch. You will have clean unaffected sound when in the bypass mode, with an LED for effect indication. Metal film resistors and capacitors ensure the cleanest compressor on the market. Hand matched transistors to less than 1% tolerance ensure you get a perfectly compressed signal, no chance for unwanted distortions. For those wanting a better tone than that of Trey Anastasio from Phish or David Gilmore of Pink Floyd or the Edge of U2 this is it. Keeley's compressors are completely hand built and tested to ensure that there are no failures. The guitar pedal is "semi-abused" to make sure there is nothing but bliss when you install your new compressor. Since each compressor pedal is hand made there might be small differences as improvements are made. Every attempt is made to make sure your Keeley pedal looks perfect and sounds better than you imagined.